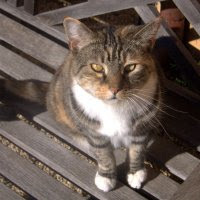 I've been getting through a bunch of clean-up tasks in the garden in the last few days. Out with the old to make way for the new! Bed #1, which was where I grew mostly curcurbits through the summer and into the fall, is now pretty much cleared out. I'll be sowing a mustard based cover crop there in the next few days, weather allowing. That will grow through the end of March when I'll cut it down, dig it in, and let it rot for a few weeks before prepping the bed for tomatoes and peppers. I cut down all the frost bitten tomato vines from the trellis in Bed #2 and I've sown three varieties of fava beans along the trellis. My long time favorite Extra Precoce Violetto is back, along with Extra Precoce A Grano Violetto which is probably the same variety but it's from a different source. The third variety is Aguadulce. I sowed those in a single row along the trellis. Last year I sowed a row of beans along either side of the trellis, but I think it will be easier to keep them under control by tying them to the trellis from just the one side. I did sow them closer together than last year since they won't have any competition from the other side of the trellis. The mustard that is growing along either side of the single row of the lower growing Robin Hood Fava beans was starting to compete with the favas so I cut down one row of it, cut it up, and dug it into the part of bed #3 where the onions will be growing. The only thing left in Bed #2 from the summer are the amazing Aji Amarillo plants. The Aji Amarillo Grande plant finally produced the bulk of the ripe peppers today, I harvested them this afternoon. Bed #3 has been cleared of all the summer and fall vegetables other than the I'itoi onions. The right side of this bed will be home to mostly onions and shallots well into summer. I've got tiny little seedlings already growing for a number of varieties of onions that I'm trying this year plus more of the Zebrune shallots that have done so well for me. I plan to get those into the garden in the next couple of weeks. Bed #3 will be where I grow greens, salad greens, brassicas, roots, and other miscellaneous veggies in 2017. I've already started the transition with an early planting of broccoli set out under the protection of water bottle cloches. And spinach is getting a head start (late start?) also. They were starting to outgrow their cloches and I needed the cloches for the definitely late sown favas so I set up a cage to protect the young plants from critters. The last two cloches are providing added protection for directly sown seedlings that replaced a couple of plants that didn't survive being planted out in paper pots. It looks like I'll be harvesting spinach quite soon! I had to cut the Peppermint Stick chard back extremely hard because of aphids and it's slow to make a comeback, it's hiding in the back corner. The Golden chard is slow to grow also but looking better because it didn't get such a severe trim the last time I harvested from it. Both of these varieties of chard usually go into hyper growth when the days get longer and warmer but they don't bolt right away. They should produce all the chard I want through the spring. 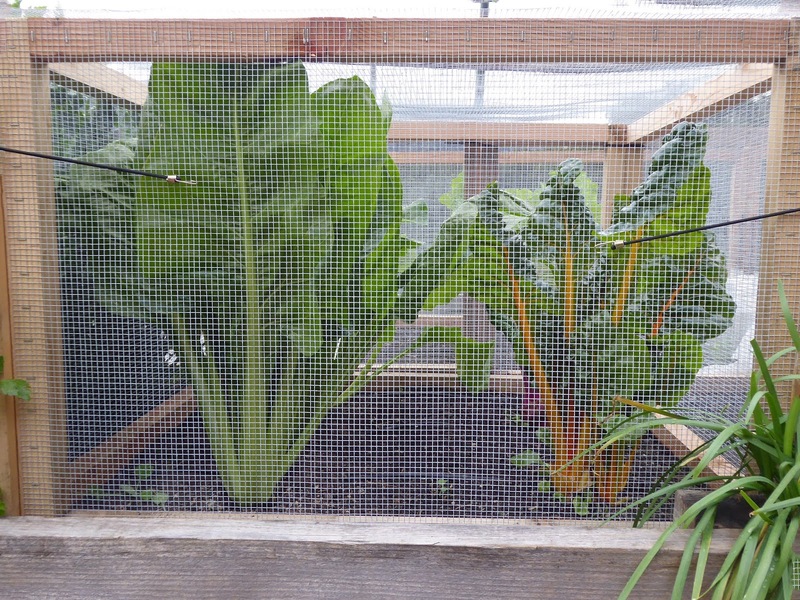 The Syrian Medieval chard on the left is a more modest grower but seems to be really enjoying the cooler weather. This variety is more prone to bolting than the other two so I expect it to be the first to go when the weather warms up. I took this photo just before I harvested about a dozen good sized leaves from the plants. I'm still getting really good stalks of Pink Plume celery. These are the last 3 plants of an original patch of 8 plants. They've been producing on a cut-and-come-again basis since June. Most of the plants bolted at some time during the season but fortunately 2 of the last 3 plants that I left at the end of the bed have not tried to bloom yet. I cut one of the three remaining plants down to a nub because it was bolting but it's putting out a lot of new side shoots now. Look closely at the top of the Brussels sprouts leaves and you'll see that the birds have developed a taste for them. After the photo shoot I covered the tops of all the plants with a length of tulle fabric to try to deter the munchers. Up and comers in this bed include the Kolibri/Kongo kohlrabi mix that did so well for me this fall. I need to cut back the cilantro that is encroaching on their space. 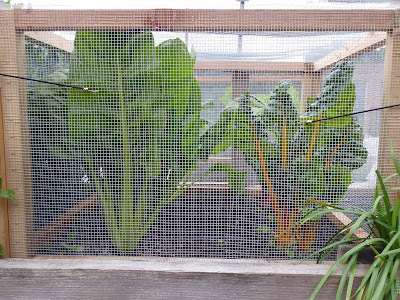 And I'm experimenting with very late sown radicchio under the cloches. They are growing relatively quickly so perhaps I'll get at least some leafy greens from the plants. And finally there's some Mizunarubasoi getting started under cloches. I grew it this spring, direct seeded in a couple of rows thinking that I could harvest it by trimming it as it grew, but it grow so fast and so large that I had to give up on that and harvest entire plants. So this time I started them in a pot and then chose the biggest seedlings to set out individually. They are coming along quickly and I should be able to do a bit of trimming soon. The clumps between the bottles are the extra seedlings that I just plopped in in a couple of bunches with the plan of cutting them early. Well, the birds decided to do some trimming for me so they are a bit runty. I've got this section of the enclosure adequately covered now so they should have a chance to size up a bit before I have to harvest them when I free their mates from the cloches. That's the latest in my garden. Happy New Year! The harvests, for the most part, turned quite seasonal in the past week. First I had to harvest some Brussels sprouts because they were starting to split open. I have been harvesting mostly the Hestia variety so far because they are a bit loose and large and the aphids were invading. The Gustus sprouts are more solid but they are getting to be large and the most mature ones are the ones that are starting to split a bit. I caught them before they split wide open so they were perfectly fine for cutting in half and roasting. I like to roast the sprouts in a large cast iron skillet. I preheat the skillet in a 400ºF oven. First I cut the sprouts in half and then toss them with some olive oil, salt, and pepper. When the skillet is good and hot I toss in the sprouts and turn as many of them cut side down in the pan as will fit so that the cut side browns nicely. It's important to not crowd the pan too much or the sprouts will steam in their own juices. About half way through the roasting, about 15 minutes, I add chopped onions (I'itoi this time), bits of pancetta, pine nuts and pepper flakes, without stirring the sprouts. After another 10 or 15 minutes I remove the skillet from the oven and toss the sprouts in the skillet with some good quality vinegar. One of my favorite vinegars to use for this is the Late Harvest Honey Viognier from Katz, it is both sweet and tart with a nice honey flavor. The sprouts get nice and browned but not overcooked when they get started in a HOT skillet. Adding the condiments half way through insures that those don't get burned. What a difference there is between the Brussels sprouts harvests last year and this year. 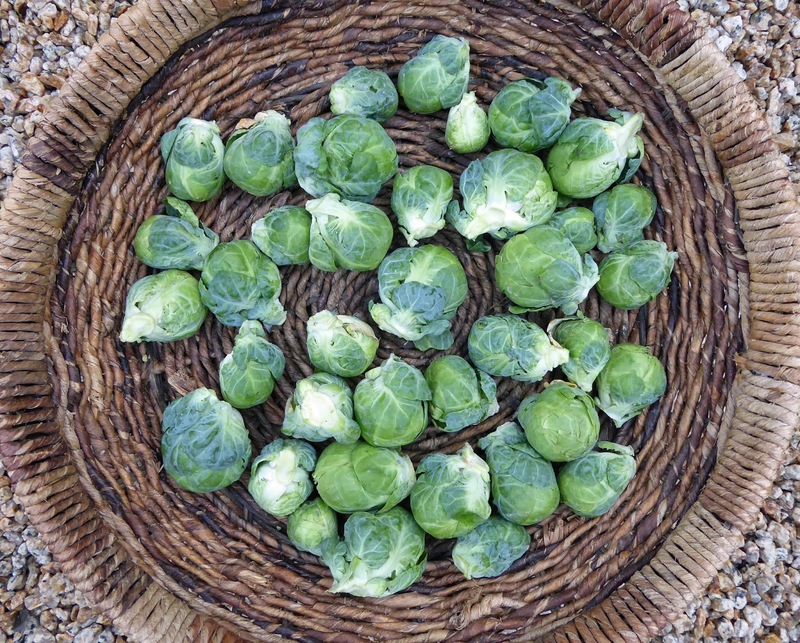 I started harvesting the current round of Brussels sprouts on November 7, well before my target of Thanksgiving. The plants that I started in the summer of 2015 with hopes of a Thanksgiving harvest last year weren't ready to start harvesting until January 7 of this year. Last year I sowed the seeds in July and this year in June. I also gave the plants more space this year so they have grown larger than they did last year. We were in the mood for a hearty chicken and vegetable soup this weekend because Dave caught a nasty bug and I felt like I might be succumbing also. So the rest of the harvests were intended for the soup. I pulled the first parsnips. What would a veggie soup be without celery? I think the cold weather is really intensifying the color of the celery. All together now for some perspective on various sizes. Those first parsnips are bigger than I expected. And the Tronchuda Beira cabbage plant gave up a couple more leaves. The freezing temperatures that they endured last week caused some of the stems to crack but they are in good shape otherwise. A few other things got added to the tally that had been harvested earlier but not yet accounted for. I finished shelling the Puhwem corn and got it all winnowed and weighed. Not pictured were more tomatoes that ripened on the kitchen counter and got used. All the cherry tomatoes in the tally this week were split, dusted with a mixture of ground dried green fennel, dried smoked NTR peppers (from 2015), powdered dried Exhibition onion, and Red Boat salt, and then they were dried. That's my favorite new thing to do with cherry tomatoes, the seasoned dried tomatoes make a great snack. The rest of the tomatoes in the tally got used in salads. 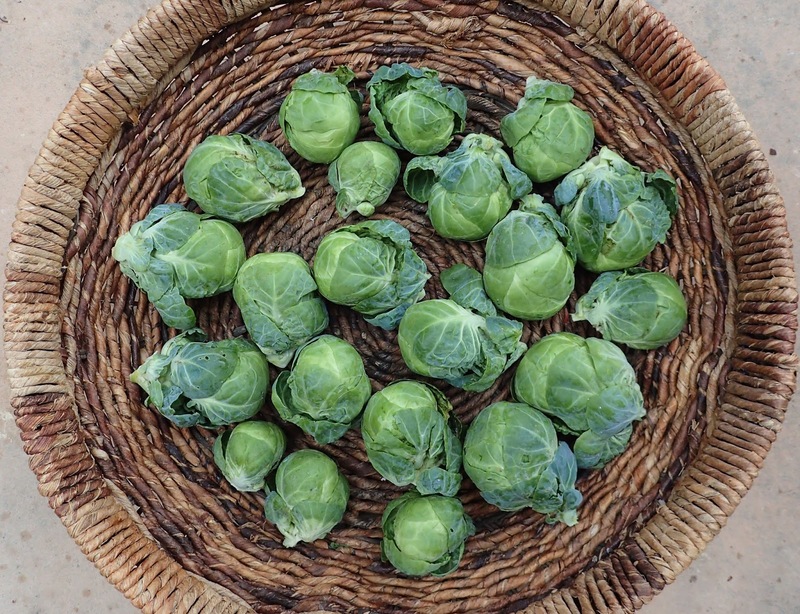 Gustus Brussels sprouts - 1 lb. Tronchuda Beira cabbage - 11.4 oz. Nelso carrots - .9 oz. Rotild carrots - 8.3 oz. Pink Plume celery - 2.8 oz. Puhwem flour corn - 7 lb. Gladiator parsnips - 8.3 oz. Camp Joy cherry tomatoes - 10.2 oz. Chianti Rose tomato - 4.9 oz. Mavritanskite tomato - 4 oz. 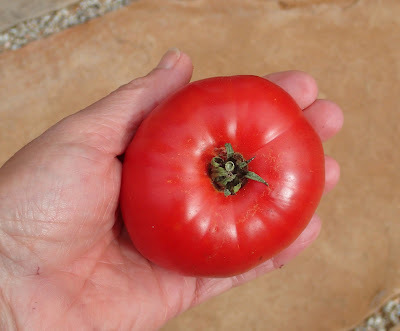 Pantano tomato - 13.6 oz. Piccolo Dattero cherry tomatoes - 5 oz. 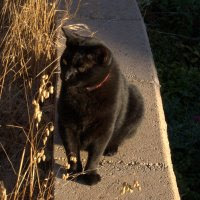 I forgot to mention when I first published this post that I will be standing in for Dave as the host of Harvest Monday for the month of January. Dave deserves a break now and then for sure. 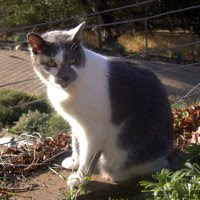 So don't forget to come and link up here, I'll have Mr. Linky going for you to add a link to your harvest post and find links to other harvests posts. The garden is in winter mode now that it's been hit with a couple of blasts of below freezing temperatures. Bed #1 is definitely ready to be cleaned out and planted with the winter cover crop of mostly mustard. Beyond in Bed #2 you can see the protection that I set up over the Aji pepper plants. As you can see the protection was effective. The Aji Amarillo Grande plant is alive and well and the remaining peppers are in excellent shape. Much to my amazement they are continuing to ripen. The Baby Aji Amarillo plants are on the left, pepperless but still alive and well. And there's one Mareko Fana plant hiding in the rear on the right - it's still alive too. Elsewhere in Bed #2 I've got early sown Robin Hood Fava beans. I wasn't so sure how they were going to do after a couple of nights of freezing temperatures. The plants didn't look very happy in a frozen state. But one week later they look totally unfazed by the freeze and they are even starting to bloom. I won't bother to show the frost nipped tomato plants, most of you know what a sorry sight that is. Over in Bed #3 I've got some spinach and broccoli seedlings started under water bottle cloches. But both the broccoli and spinach sailed through the cold and are growing. I may be harvesting some spinach in a few weeks. There's new seedlings hiding in water bottles in Bed # 4 also. There's a few brassicas that should be sweeter for the freezer treatment. That's the latest from my winter garden. An early Merry Christmas to all of you who celebrate. Whoa! 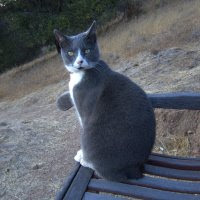 I just noticed that this is my 800th published post! This is the last harvest post for what is technically still fall although the weather is decidedly winter. 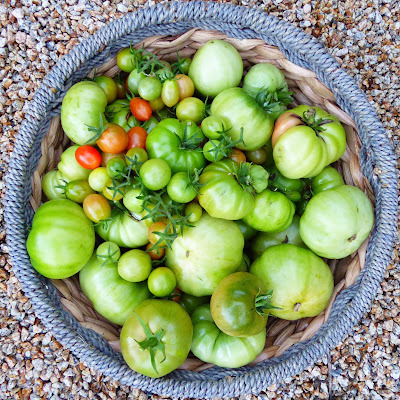 The first freeze descended upon the garden on Sunday morning so in anticipation of that I collected the last of the tomatoes that seemed to have any chance of being tasty after ripening on the kitchen counter. There were a couple more Aji Amarillo Grande peppers that were ready to harvest and they joined the previous Aji harvests in another batch of pepper jam. There are still green and ripening peppers left on the plants so I swaddled the plants in a combination of greenhouse plastic sheeting and Agribon frost cloth in an effort to keep the plants and peppers from freezing. The plants looked ok yesterday afternoon but it froze again this morning so I won't know if they survived the double dip until later. Here's a photo of the Hopi Chinmark corn that I put into the tally last week. There will be regular photos of Brussels Sprouts for the next few weeks. The freezing nights should make them extra sweet. And there should be regular shots of carrots too. I wonder if the cold temperatures sweeten them up also? The only other harvests last week were a couple of cuttings of Pink Plume celery and a couple big leaves of Tronchuda Beira cabbage. I harvested a number of the largest stalks of celery to keep on hand just in case the freezing temperatures ruined them. I covered the plants with a double layer of frost cloth that I hope will protect them from freezing so perhaps I can get a few more harvests through the winter before the plants bolt in the spring. Also included in the tally are more tomatoes that ripened on the kitchen counter. Here's the details of the harvests for the past week. Gustus Brussels sprouts - 14.2 oz. Tronchuda Beira cabbage - 1.1 lb. 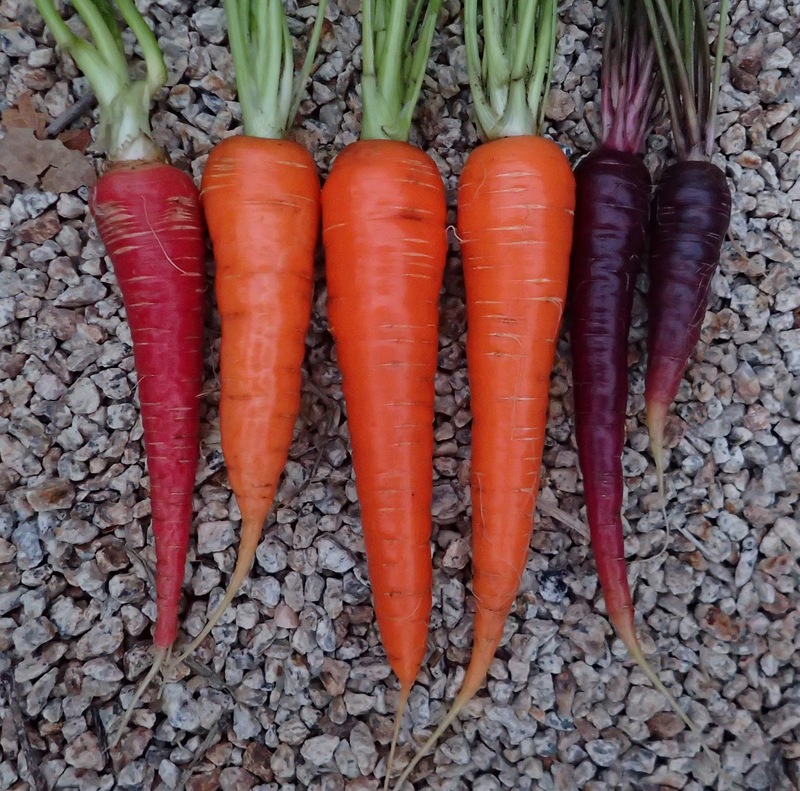 Purple Sun Carrots - 2.8 oz. Pusa Rudhira Red carrot - 2 oz. Rotild carrots - 11.5 oz. Pink Plume celery - 1.3 lb. Aji Amarillo Grande peppers - 1.8 oz. Pantano tomatoes - 10.6 oz. If I'm awake at 2:44 AM PST this Wednesday morning I'll celebrate the Winter Solstice in some small way to note the start of lengthening days. Summer is coming! Eventually.... It happens at the exact same time throughout the northern hemisphere but because the earth is divided into 24 different time zones we won't all experience it at the same time of day. Sorry to you in the southern hemisphere - your days are going to become shorter. The harvests are a mix of seasons again, but this week I'll start off with the more seasonal ones. The Calabrese broccoli plants are still producing a few shoots now and then. And the 2 Dazzling Blue kale plants are steady producers. 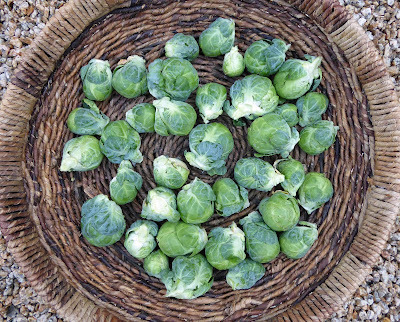 There's plenty of Brussels Sprouts ready to harvest also. A couple of the Hestia plants continue to produce big loose sprouts but they are fine for shredding so I've not removed the plants as I had threatened. A made a double batch of the dehydrated Brussels Sprouts & Carrot salad that I blogged about a while back. My camera ended up on some artsy setting accidentally so some of the photos ended up a bit odd looking. The carrots are keeping well in the garden now that the weather has become quite cool and the days are short so I'm harvesting them on an as needed basis. The last two heads of lettuce that were lingering in the garden needed to be harvested to make way for some kohlrabi seedlings. Tomatoes! Dave and I have really been enjoying the tomatoes that I picked a couple of weeks ago. I waited until they were just starting to get a bit of color on the vine and then I brought them in to finish ripening on the kitchen counter. They have been amazingly good. I've been weighing them as I use them. We've not had a freeze yet, just some radiation frost one morning that didn't harm the plants so there's still some lingering squash and tomatoes. Nearly all the Baby Aji Amarillo peppers ripened on the plants and that's the last of them shown above. The Aji Amarillo Grande peppers are much slower to ripen, there's a number of green and partially ripe peppers still on the plants. I've rigged up some protection for the plants so I hope to be able to harvest a few more ripe from the garden peppers. That's about half of the ears of Puhwem corn that I harvested this year. The other half have been shucked and you can see the kernels in the basket on the right. I had to harvest the ears before they had dried on the plants because the weather turned cold and wet and I was afraid that the ears would spoil. So the ears have been drying on my living room floor. I shucked and weighed the Hopi Chinmark corn but haven't taken a photo yet. One other harvest that didn't get photographed was more Pink Plume celery. The Honey Nut Butternut squash aren't keeping very well, some of them are starting to shrivel up, so I roasted a few of them and we enjoyed one just simply roasted with some butter and a couple more went into a Winter Squash Galette and there's one roasted squash left in the fridge to consume in some other way. My favorite squash galette recipe is from Deborah Madison's book Vegetarian Cooking For Everyone (the original edition). The recipe is available here. 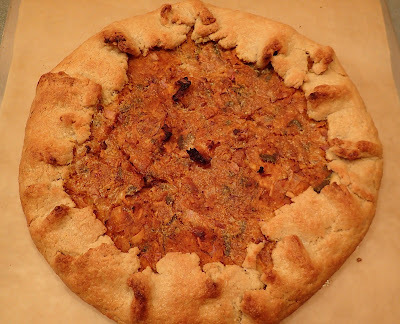 I have made a few changes though, I use a Sonora whole wheat short pastry instead of the yeasted tart dough and my squash were incredibly sweet so I added a half tablespoon of brown rice miso to the filling to temper the sweetness. Calabrese broccoli - 6.6 oz. Hestia Brussels sprouts - 1.7 lb. Bolero carrots - 15.8 oz. Purple Sun carrots - 3.3 oz. Pink Plume celery - 9.1 oz. Hopi Chinmark corn - 4.8 lb. Dazzling Blue kale - 1.1 lb. Manoa Crisphead lettuce - 9.2 oz. Aji Amarillo Grande peppers - 4.4 oz. Chianti Rose tomato - 6.2 oz. Mavritanskite tomato - 8.7 oz. Pantano tomatoes - 1.3 lb. Tromba D'Albenga squash - 2.9 lb.